But this preoccupation is nothing new. If you’re reading this, you’re probably old enough to remember when Garfield’s potbellied portrait was featured nationwide in comic strips, on calendars, and even on network television. He was an American icon. While a carb-chugging cantankerous kitty is funny in fiction, the realities of caring for an overweight pet are far less amusing. In fact, the grim prospects for many overweight cats (and dogs) include a litany of ailments that eerily mirror the health problems that commonly afflict overweight humans. Carrying extra weight puts stress on the joints and can lead to pain and decreased activity. In some breeds of dogs, this excess weight can contribute to orthopedic problems such as ruptured ligaments in the knees and disk disease in the back. 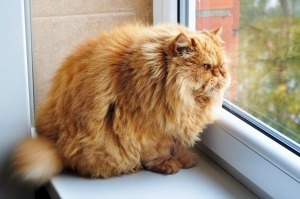 In overweight cats, diabetes is a relatively common diagnosis. Certain types of cancers are also seen more commonly in overweight pets than those at a healthy weight. Shortened life spans are yet another possible result of carrying that extra weight, as are hypertension and liver or kidney disease. The most sobering fact: the majority of U.S. dogs and cats are overweight, and most pet owners aren’t aware of the problem, according to the Packaged Facts report Senior, Weight Management, and Special Needs Pet Products in the U.S., 2nd Edition. This means there are too many pets that not receiving the necessary dietary adjustments or medical attention necessary to combat their expanding waistlines. Much as is the case with humans, pet obesity comes with a hefty financial cost. According to one of the largest pet insurance companies in the U.S., Nationwide (formerly known as Veterinary Pet Insurance or VPI), in 2014, members filed more than $54 million in pet insurance claims for conditions and diseases related to pet obesity, a 10% growth over the past two years. In 2014, Nationwide received more than 42,000 pet insurance claims for arthritis in dogs, the most common disease aggravated by excessive weight, which carried an average treatment fee of $292 per pet. With more than 4,700 pet insurance claims, bladder or urinary tract disease was the most common obesity related condition in cats, which had an average claim amount of $424 per pet. So what are pet owners to do? First, they must admit and recognize that their pet has a problem. Next, switching to a diet that is not as calorie dense is one step they can take. Cutting back on treats is another change that can make an impact. One pig ear is equivalent to a six-pack of sodas, so a daily pig ear is adding a lot of unnecessary calories to a dog’s diet. Treats do not need to be eliminated, but smart choices need to be made, especially when a pet needs to lose weight. This may be a challenge, especially for pet owners who love to pamper their pets and view “treat time” as a way to show their affection. To be effective, part of the education efforts involving pet owners should include options for pampering that don’t include feeding, such as walks, play time, and showing physical affection in other ways. In the past, one of the challenges of feeding a low-fat, high-fiber weight-loss pet diet was poor palatability. However, pet owners now have more options with the number of weight management foods on the market, and can choose foods made with high protein and moderate fat content to help pets lose weight without complaints from “picky eaters.” The high protein content prevents the loss of muscle tissue during the weight loss process and forces the pet’s body to burn fat for energy. In general, pets much like their owners, are living longer than ever. As a result, at least some health problems are inevitable. The key is making sure that our pets age as gracefully as we do and suffer from as few ailments as possible. Monitoring their weight is perhaps the first step in safeguarding the long-term health and happiness of our beloved animal companions. Check out Senior, Weight Management, and Special Needs Pet Products in the U.S., 2nd Edition by Packaged Facts, a leading consumer research firm. This report draws on primary and secondary research that measures purchasing patterns and attitudes of dog and cat owners.